Here is a video of the Lowbrow Tarot group art show which took place in October of 2010 at La Luz de Jesus Gallery. The show was curated by Aunia Kahn and included the artists Carrie Ann Baade, Christopher Ulrich, Edith Lebeau, Cate Rangel, Kris Kuksi, Chris Mars, Christopher Umana, Chris Conn, Brian M. Viveros, Claudia Drake, Heather Watts, Molly Crabapple, David Stoupakis, Laurie Lipton, Patrick “Star 27” Deignan, Chet Zar, Jessica Joslin, Danni Shinya Luo, Jennybird Alcantara, Angie Mason, Scott G. Brooks, Aunia Kahn and Daniel Martin Diaz. The video was shot and edited for Vancouver, BC artist Heather Watts ( www.heatherwatts.com ) by Mike Wollen of Foundry Films. 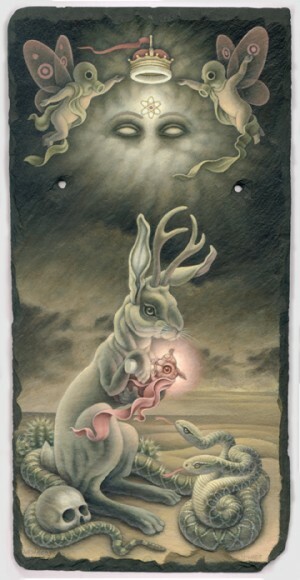 Watts will be showing a series of pieces at La Luz de Jesus Gallery this coming April 2011.